Meet the English Department Faculty! 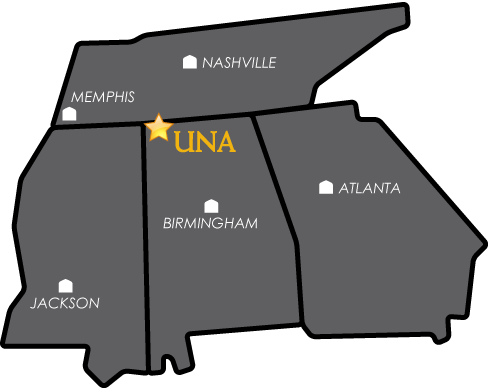 Dedicated faculty are what make the English major a success at UNA! an international English honor society. The Department of English offers a major program in English with options in English, Language Arts, and Professional Writing leading to the Bachelor of Arts or Bachelor of Science degree. The department also offers a master's degree in English as well as minor programs in English, Professional Writing, and Film Studies, and basic courses required in the general studies components in all degree programs. The major in English is designed to offer students a broad background in literature and language as a preparation for teaching, for graduate study, or for careers in a large number of fields. A degree in literature develops the creative and critical minds of students who wish to master the English Language. Through the study of multiple literary genres, students gain the analytical skills needed to excel in a variety of professional experiences and graduate programs. Cultivating business minds for tomorrow's workforce, a degree in professional writing equips students with the skills and professional etiquette needed to outshine the competition. This option is designed to prepare students interested in using their communication skills for careers in government, business, industry, social service, or freelance writing.This major focuses on composition, editing, and design of creative and technical writing. A degree in Language Arts allows students to pursue a variety of educational-based careers in English. Students develop strong interpersonal skills alongside a working knowledge of the English Language. An Education major is also required for this option.